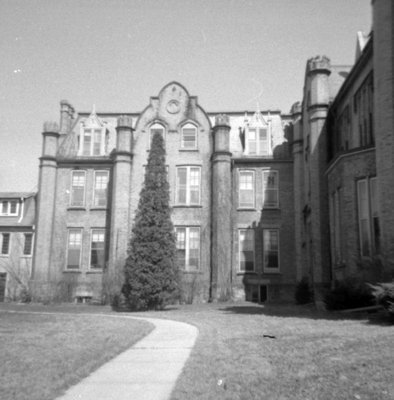 A black and white photograph of Ryerson Hall at the Ontario Ladies' College. Trafalgar Castle was built for Nelson Gilbert Reynolds (1814-1881), Sheriff of Ontario County from 1852 to 1881. Trafalgar Castle was designed by Toronto architect, Joseph Sheard and built between 1859 and 1862. The Sheriff lived in Trafalgar Castle from 1862 until 1874 when he sold the building to the Methodist Church of Canada for use as a ladies college. Ontario Ladies' College is now known as Trafalgar Castle School. Ryerson Hall was added to the school in 1877. Ontario Ladies' College, April 23, 1970, Brian Winter. Whitby Archives A2013_004_387.